Colombia’s President Duque has lost even the support of his own party over a controversial tax reform that sought to impose income tax on lower-income households and introduce a sales tax on basic food products. Duque’s political patron, former President Alvaro Uribe, and their party, the Democratic Center on Friday left Duque to deal with the fallout of his highly unpopular tax reform proposals on his own. The proposal to tax the items of the family basket with VAT has created a justified citizen concern, which although it could be compensated with the return to the poorest compatriots, would persist in affecting middle-income compatriots. Now that Duque has even been abandoned by his political patron, his proposal is likely to be rejected by Congress and be a major blow for the president’s whose approval rating was already dropping less than three months after he took office. The coalition Conservative Party had already criticized the plan and the “independent” Liberal Party and Radical Change had also said they would not support the reform. The leftist opposition had a field day bashing the isolated president, his controversial Finance Minister Alberto Carrasquilla and the proposals that many economic experts considered detrimental to the economy and a financial assault on the spending power of the middle class and the poor. Duque started his presidency in August with the lowest approval rating since polling in Colombia began. The president’s attempts to make controversial changes to the 2019 budget proposal prepared by his predecessor Juan Manuel Santos spurred and his attempts to tax the poor while offering perks to the rich appear to have devastated his authority. Duque vowed to “lower taxes” and prevent “Colombia turning into a second Venezuela” ahead of his June election. Few voters, however, were aware that he exclusively referred to corporate taxes in his government proposals. Once in office, the proposals spurred a drop in support from the middle class and a rise in popularity of anti-corruption advocates who perceive Duque as the personification of the country’s elite that has controlled government through nepotism rather than merit, often with disastrous consequences. The president has had trouble establishing himself as the legitimate head of state because of mass voter fraud in both the legislative elections in March and the presidential elections in May and June. Furthermore, Duque’s referral to his political patron as “the eternal president” left questions about who effectively is in power; the president or Uribe, who is investigated by the Supreme Court and is slowly submerged by war crime allegations. The president, who never held a significant executive position before becoming “the guys Uribe says,” knew before taking office that ruling Colombia would be difficult; legislative elections in March considerably strengthened leftist opposition in Congress. 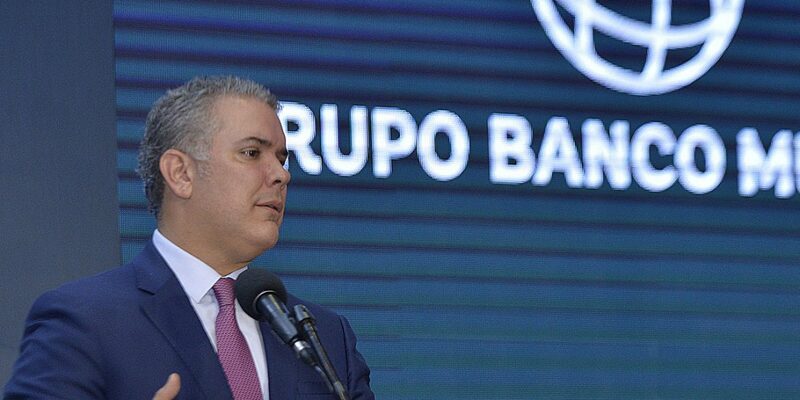 What Duque and analysts didn’t expect was that his own political patron needed less then three months to leave Colombia’s president like an emperor without clothes.